The way in which the tower ‘rotates’ was a hugely unique feature for this game. Nebulus was a popular game released by perennial 8-Bit Publishers Hewson, but this was their best game in my opinion. 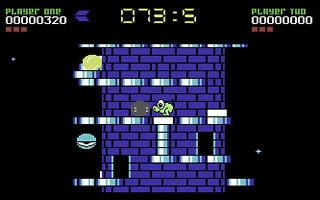 You played a fairly nondescript frog-like animal, who’s goal was to climb to the top of a number of towers. That was it, it sounds boring, but here me out. What makes this game good is the innovation, and the amount of fun you have playing it. You see, the innovation came with the look of the game. Instead of nondescriptly leaping from platform to platform, the world – the tower – revoles around you. Instead of dying when hit, you simply get knocked down the tower. If there’s a platform beneath you, fantastic, you can continue (albeit trying to beat a strict time limit), if there isn’t, you go in the water and drown (which is odd, considering it looks like a frog). Should you reach the top of the tower, the tower is destroyed and you return to the submarine for a bonus game – shoot and collect little tadpole things, and then onto the next tower. The game isn’t perfect – the control system is a bit difficult to get to grips with, and the game’s “monsters” are a few geometric shapes, but the fact remains that as a budget platformer it’s pretty good. Well worth playing and will keep you busy for an afternoon. Another rare type of game you’ve pulled a review out on. I first found this gem on a cover of I think, commodore format. The game I found had a perfect difficulty curve to it, another i never completed but kept going back to.